Yesterday, I joined the founders of Juicy Couture for the launch of their book “The Glitter Plan”at Bloomingdale’s 59th and Lexington Avenue. Splendid event! I not only met Pamela Skaist-Levy and Gela Nash-Taylor and got their autograph, but also shook hands with Glenda Bailey. Do you know Glenda? She is the editor-in-chief of Harper’s Bazaar! Yes, the queen of fashion publishing emporium, the grande dame of one of the biggest fashion magazines in the world!! And she shook my hand and smiled at me! Wow! Let’s look at “The Glitter Plan” where Pam & Gela tell us how they met and started Juicy Couture for $200! What a story! Whimsical writing, fascinating story with lots of entrepreneurship advice for anyone who is ready to start their own business venture. 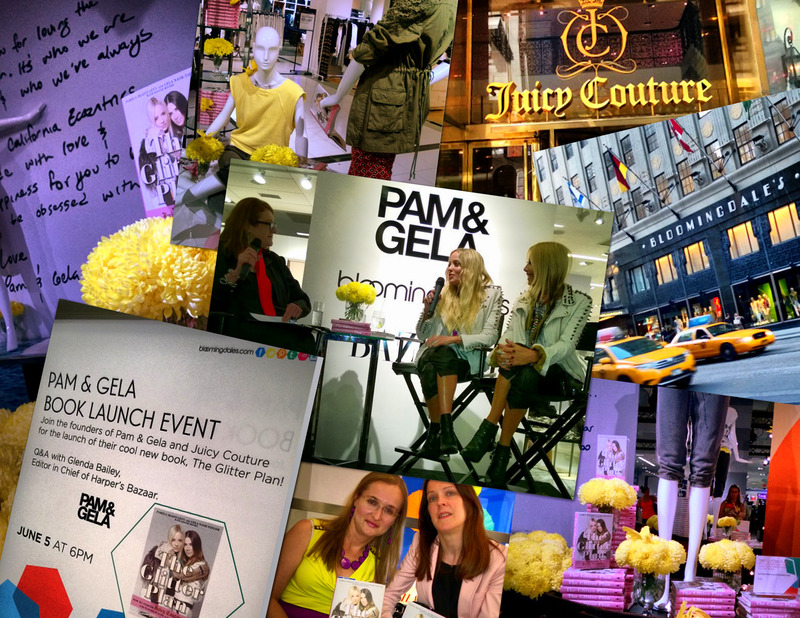 We heard about Pam & Gela’s dreams, passion for fashion, enthusiasm, perseverance, struggles and first rewards that led to a huge success and turned Juicy Couture into a worldwide luxury icon. But even if you don’t have any “glitter” plans yet, the book is worth reading for its juicy content and playful writing. 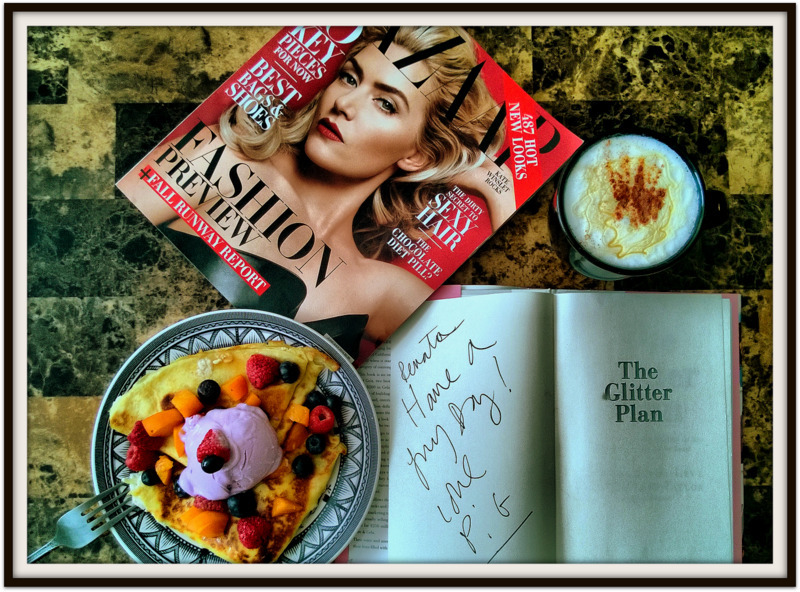 So, go grab “The Glitter Plan”! Pam & Gela started Juicy Couture for $200 but guess what they sold it for? $53.1 million! Incredible! They sold it to Liz Claiborne Inc. So what are Pam & Gela up to now? They are starting a new line straight from sunny L.A called… Pam & Gela! The collection features casual, luxury clothing based on California aesthetic. Fresh, lace, embroidered pieces that will keep you cool this summer! Love it! My favorites are: Broderie Anglaise Audrey dress, Pom-Pom top, Cotton Baby Doll Crochet Lace Top, Embroidered Lacey Voile Blouse. Check them out at Bloomingdale’s and Neiman Marcus. Many thanks to Allie from Allienyc.com for great company! Obviously this was really a splendid event! beautiful! Loving your fashion taste! Yes this was such a fun event! And so enlightening! I had a great time attending the event with you and can’t wait for the next one! Looks like an incredibly fun event!